Looking for a church emcee script to help you prepare for an occasion in church where you have been asked to do emceeing. We have made one that is downloadable that is in the PDF format, and you will get it immediately after paying a price of $ 4.99 . The script is in 3 pages and arranged in an orderly manner which will help you not to memorize many things.We have made it simple in that it can fit to any occasion or program in the church. How is the script formatted? It has got what to say before the program starts. How to give the closing remarks before the program of the church ends. Don't be anxious we are here to help you during the occasion. we want first to thank you for visiting our page and we are praying for you as you prepare for the occasion and let you know that God is with you. The church emcee script that you can download instantly. Be sure that the above emcee script is best that you can have. I encourage you to download and have it ready for the occasion, you will see how beneficial its. Even if you have done an emceeing job before, we have some ideas that you can find in that booklet that will help you. Above all pray and trust in the Lord to guide and help you as you lead the program from the front. That is what you expect in the church emcee script that we have written in PDF for you to download. PDF is very common and you can freely download it here if you have not installed in your devices. We hope that the church emcee script in PDF will serve you well in the up coming event in the church that has requested you to emcee the occasion. We want to pray for the Lord to give you wisdom and knowledge so that you can make the day a success. Very many people during the day expect you to make it lively and therefore don't let them down as they have a lot of expectation during the day. We pray for the Holy Spirit to guide you and to give you what to say during the day. Even if you have emceed before or this is your first time.We don't know always what we expect during the occasion but we know that with God all things are possible. Therefore download the church emcee script we have given you and let the Holy spirit take charge now. The above MC script will show and help you on how to be a good master of ceremony in church. It is great and to the point. Once you get it, you are fully set for the occasion, no more worries and shall have less anxiety. We have made sure that you are ready for any occasion in church. The script can fit in any occasion. Below are some of the examples that you can use the script for. Looking for an emcee script for Sunday service? to help you during the upcoming Sunday service in the church. find the one we have prepared for you that you can download and start using it immediately. It is in PDF file..
Have been asked by your church to emcee during a church program and don't know where to begin. 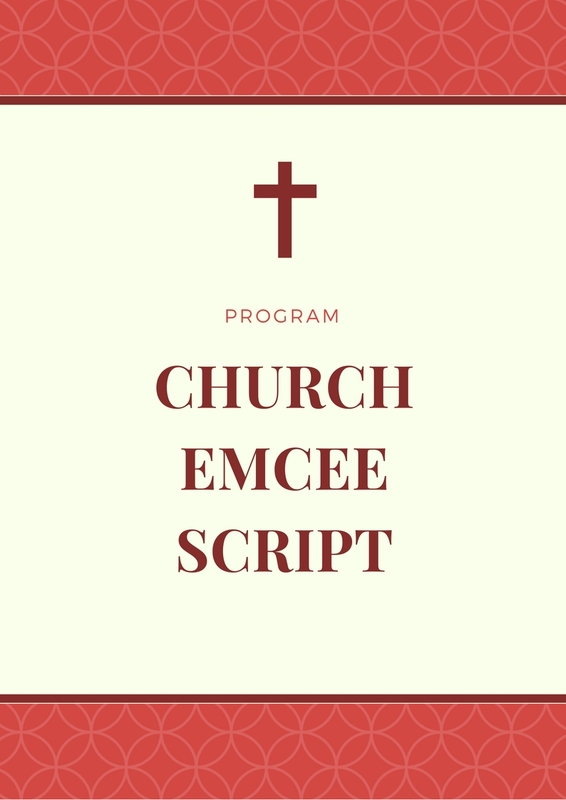 Here is is the emcee script for church program for you. Are you looking forward to a church anniversary in your church and have been asked to be be the emcee of the event, but since you are new. You don't know where to start and have landed our page we help you? Here we have prepared for you one that you can download and use it immediately. You need a PDF file for you to get it. Here we go..
Has your pastor or the church requested you to prepare to emcee a church service and you have never been one or done so. Don't be nervous, I welcome you to our page. Have already prepared one for you that you can download and get ready to use it in the upcoming church service in your church. Are you looking forward to be an emcee for the upcoming Sunday in church and are looking for an emcee script to help and guide you. We have prepared one for you. The church emcee script above is a perfect one to help you guide the Sunday service from the beginning to the end. Download it now and it will assist you in the service ahead of you. It doesn't matter if you are new and have never done emceeing before, the guide caters for people like. Get it now and you will never regret at all. Have been given a task to be an emcee in church wedding? You are in need of an emcee script? The above script will serve you will, just download it and you will never regret. We have given a step by step on how to be an emcee in your church service. You need the get the emcee script that will guide and help have a beginning and also what to say in between the service. What to say as you move a long. We promise you that you have the return of all the confidence you need once you have the emcee script in your hand. You are looking forward to a church fellowship and a surprise is that you will be the emcee of the day. On the other side you have never been an emcee and don't know what to do. We hope you have already downloaded the above script for the emcee to assist you. You can never a powerful script anywhere else like the one we have given. Get it now and you will be set for the occasion. Have been asked to lead in a church program as an emcee? Welcome to our page. We already have a church emcee script ready for you to download. The above script is good and will serve you well if you have never done an emcee work before. Once you have it in your hand then you are ready for the occasion in the church.We know how nervous one can be when you have never done emcee work before and don't know what to do. Good morning everybody, welcome to today's worship hours. We know when it comes to church events majority who happens to be emcee have never done before and many times don't know how to go about it. That is why we wrote the above emcee script to guide and help you when the need arises. Being an emcee is not magic but it need confidence and practice and therefore once you have the script we have given above then you can practice like four to five days then you are ready to be church emcee of any event in church. Above all pray for wisdom from God so that God can guide you during the day. Are you going to be the master of ceremony during the church Sunday service in your church. We have prepared a script that can assist you on what to say and how to conduct and guide the service well from the beginning to the end. To emcee any event in church is easy when you know what is needed. We are here to help have the know how to emcee a church event,occasion or a service. We have a prepared a script above and once you have it then you are set to go. With emceeing script in your hand then next practice to have the confidence that is required to lead a church event. The above emcee script once you get shall guide you from the beginning to the end on how to lead a church service. The guide is very important if you have never lead a church service before and even if you have already done it before,there new concepts that you can learn to add on what you already have. We urge to get a copy of the script now and you will be ready for the church service. If you have been given the task to moderate the church service then you are the emcee of the day. Get a copy of the church emcee script now to assist you how to moderate the church. You will find exciting guide on how to emcee the church service and will thank God for the day. We know you are asking yourself a lot of questions. How can you make the church service interesting as an emcee, thank God that you have landed on our page. You can now download the script that we have given above to guide and help you make the church service interesting. We know once you have the script in your hands,shall worry any more on what to do when you are emceeing the church service. Maybe this is your first time you have been tasked to preside over a church service as an emcee and don't know how to go about it. We have already prepared an emcee script to help and guide you from the beginning to the end on how to go about it. It is a step by step and shall assist you to have an easy work as you preside over the church service. It's not easy but once you have a guide on how you will go ab out emceeing a church event, things will be easier for you. Our work here is to make sure you are ready for the event without much huddle that many faces. We have prepared an emcee script above that you can download and start using it. Are you planning to emcee your church anniversary soon? Have you been asked to be the master of ceremony in your church anniversary and are looking for an emcee script to guide and help you? Don't worry we have prepare a script that you can use. It will guide and give the direction from the beginning to the end. It doesn't matter whether you have been an emcee before or not. You are sure of having a point of reference and what you need to do is only to follow the script. If you are given a chance to be an MC during the divine hour then our emcee script will help you. Just download it and start using it immediately. We catered for the hard part and your work is just to deliver. It is easy to be a good mc during the church service. What you need to have confidence which comes on when you know what you need to say and do. We are here to make sure you have the confidence that is required. We already have the script for you which you can download as we as more information and guidelines that can help you. Above all trust in the Holy Spirit that will help and guide you as you do the church emceeing work in church. As you look forward to moderating the Sunday service. The emcee script that we have given above will come at hand. You don't need to be worried on what to do, since we have made sure you have what you need. If you have not downloaded the script, please do right now. Count it a blessing when you are asked to emcee a church occasion program, not all can be able to do a master of ceremony in a church. Majority of church members have fear and would not be able to do it because they don't know what to say and when to say. We have stepped in with our program to help you become a good emcee for your church occasion and not only the coming one but for the rest of the time you will be called to conduct an MC role in your church. It's easy to be an MC but also difficult if you don't know the art of being one. All of us can be a master of ceremony of something..let say when you are talking to a friend, definitely you trying to be an MC over him or her because you have to control a situation. If you can picture that then you can make a great master of ceremony of an occasion in church. Take your time to learn about the art and you will enjoy doing it any time you are called for in an occasion. Many people think that in a church setting you don't need to heavily borrow what the world is doing. To an extent I can agree with them because this are spiritual things we are doing and we have to let the Holy Spirit to do His work but we need to remember that whatever work your hand finds to do. Do it yo your best. That is why we have created the step by step script to help you. Make sure you download and you will never regret on the out of the program you are going to be an MC. Just know that no one was born knowing something, we all learn to know. That is why we have this page and the master of ceremony script to help you learn and know how to be master of ceremony in a church setting. There three things you need to take into consideration when you are preparing to moderate a church event or service..
First, you need to consider time, capturing the attention of the audience and mode of the occasion. Are intending to be an emcee during the church anniversary and you don't know how to go about it? We are going to help you. We already have a script that you can download and will help you. We have a link above the page that can guide and help on the process of getting the master of ceremony script that you can use during the church anniversary celebration in your church. Once you have the emcee script, go through it and prepare well for the occasion. We hope the church emcee script you have bought and downloaded will serve the purpose you wanted it to do. We are your partner in this journey and promise that we are there for you always and praying for you too. Say Hi, to the church you are going to emcee and may our loving God be with you all through. We want to wish you all the best during the occasion. Have been tasked to be the master of ceremony during the Sunday service in your church? If it is your first time and don't know how to go aboit,then we are going to help you. With our MC script by your side you will not go wrong. We have provided a guidance on how to take control of the situation as the master of ceremony from the beginning to the end. We believe you are going to have a fantastic occasion in church. Our work from here is to make sure you are ready for the occasion by providing and giving you the necessary materials that you need. We are also praying for you so that our loving God can give you wisdom and knowledge that comes from above. We know being the first time you are going to be the master of ceremony, you have fear but with God in your side,all things are possible. We are praying for you and may our good Lord give you strength and courage to do it well. Here is the emcee script for opening ceremony. Are you planning to emcee a ceremony soon and don't where to begin. Don't worry .. We have prepared a script that you can download and use during the occasion. You will be guided what to say from the beginning to the end and above all we pray for the Holy spirit to guide and help you as you prepare for the occasion. Are you invited to be an for a birthday of your pastor, church member and so on and don't know what to say during the occasion. Don't worry. We are here for you and would love to help you what to say from the beginning to the end. Have you been tasked to be the emcee of the day in your church during the upcoming family day in church. Are you looking for a script to assist you during the day? We have prepared a script for you that you can download. The script will not only show you what to say but will guide you from the beginning to the end. Are you going to be the master of ceremony during the upcoming Christmas party in your church. Are you confused and don't know how you will handle the program of the day. Don't worry , we have prepared a script that can assist you from the beginning to the end. What you need to do is to get hold of the script in your hand and pray to God to give you the Holy Spirit to guide you as you take emcee role of the day during the Christmas party that your church has organised. Have been tasked to be the emcee during a church launching of an event. If you have never emceed and don't know what to say. We can help you. Do you have a member , an outgoing pastor or someone leaving your church soon and are organizing a farewell for the person. Have you been asked to take the role of an emcee during the event? Do you feel that you don't have words to use during the program that the church has organised. Have you been asked to be the emcee of the reunion in the church? Are you stuck and don't know what to say during the event? Being an emcee for a seminar in your church is fun and more so when you understand and know what you are supposed to do. Our work is to help you with what you are going to say from the beginning to the end. Are you going to be the church wedding emcee and don't know what you are expected to do during the time. Don't worry, the emcee script we prepared will help you out. Have been tasked to be a wedding reception emcee but don't know how to handle the customers who will attend the reception. Just a point of reminder, a wedding reception is different arena all together, this is as the result of the excitement of the occasion. If you have ever attended one, you know what am talking about and need to be aware so that you can be prepared well in advance. The emcee script that we have prepared will come at hand and will really help you as you prepare to emcee the occasion. Have you been tasked to emcee the upcoming mass service in your church but are new and don't know what to do? Our emcee script that we have prepared will give you a glimpse of what you need to know as you stand before people and be the master of ceremony during the service. We have given you what to say say in the beginning and in between, you also find what you will say at the of the service. Download the script now and start using it.